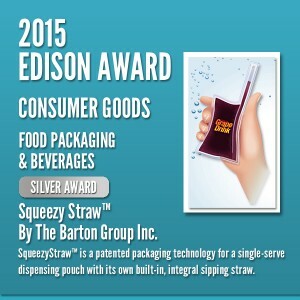 Barton Group Inc. of New York has been named a winner of a 2015 Silver Edison Award for its innovative “Squeezy Straw” packaging. For over a quarter century, the prestigious Edison Awards have recognized innovation in product and services design, sustainability and marketing, establishing itself as one of the highest accolades a company can receive in the name of innovation. “We are honored to have won this prestigious global award,” said Barton Group President Lew Barton. 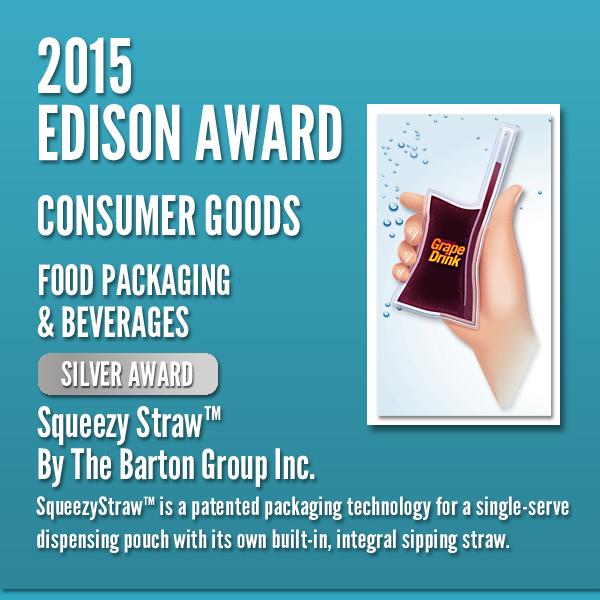 “Our Squeezy Straw™ packaging is a new single-serve dispensing pouch with its own built-in, integral sipping straw. The awards are named after Thomas Edison, whose extraordinary new product development methods garnered him 1,093 U.S. patents and made him a household name around the world.